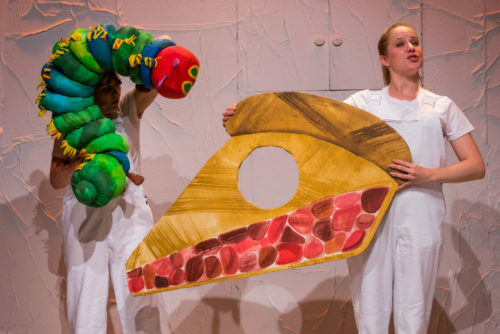 The Very Hungry Caterpillar Live on Stage - Kidtivity.com - Family Fun in Greater Connecticut! The Very Hungry Caterpillar Live on Stage is a critically acclaimed production of The Very Hungry Caterpillar Show created by Jonathan Rockefeller features a menagerie of 75 lovable puppets. The production faithfully adapts four stories by author/illustrator Eric Carle: Brown Bear, Brown Bear, 10 Little Rubber Ducks, The Very Lonely Firefly and The Very Hungry Caterpillar, the star of the show! The Very Hungry Caterpillar has delighted generations of readers since it was first published in 1969 selling more than 43 million copies worldwide. Brown Bear, Brown Bear – now celebrating 50 years – has sold more than 16 million copies. The recent January 2018 release, Love From The Very Hungry Caterpillar, is currently #1 on the New York Times Bestseller List for Children’s Books. VIP tickets includes preferred seating (first few rows) along with an pre-show meet and greet and photo opportunity with the characters. Sensory Friendly Performance at 10:00 a.m. For tickets, please CLICK HERE and use the code SENSE19 when purchasing online or via The Bushnell Box Office.